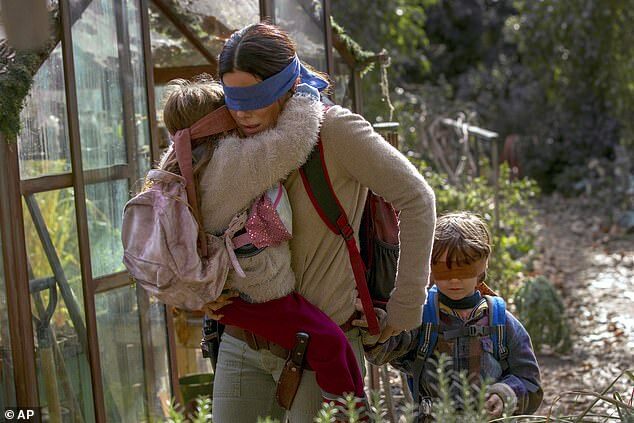 Netflix‘s post-apocalyptic survival film Bird Box is drawing criticism for using footage of a real fiery train disaster but the streaming giant has no plans to remove it. In the popular Netflix film, footage of the crash appeared within the first five minutes. 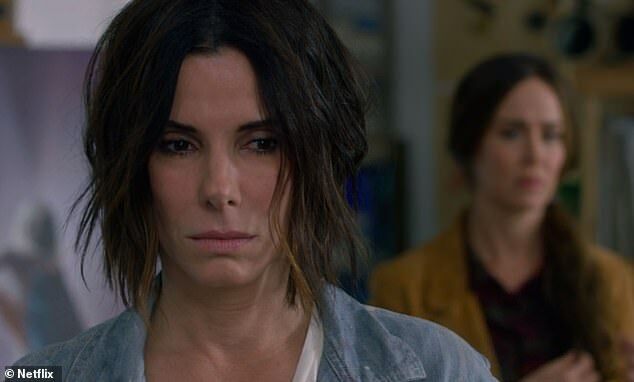 Sandra Bullock, who stars as the main character, Malorie Hayes, is seen watching TV of catastrophic incidents across the world. In that moment, the clip of the fiery train crash appears on the screen as her sister, Jessica Hayes, played by Sarah Paulson, watches in the background. The thriller is about monstrous entities that compel any human who sees them to quickly try to kill themselves. To survive, they don blindfolds. In a statement Pond 5, who provide royalty-free media, said the footage ‘was taken out of context’ and the company wanted to ‘sincerely apologize’. Netflix also confirmed the usage of the footage in Bird Box. Canadian officials have called for the removal of the clip from the scene. 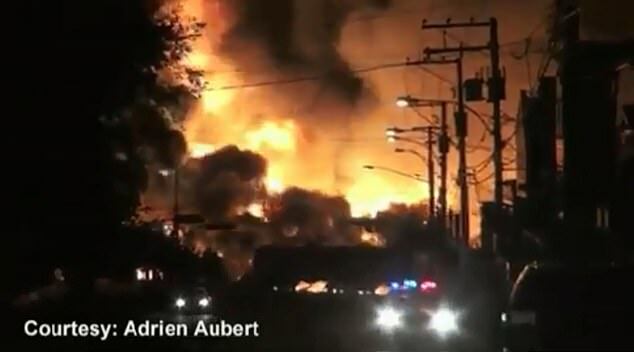 The mayor of Lac-Megantic, Julie Morin, has decried the use of the footage in an interview with the CBC. ‘We find that it’s really a lack of respect, to use these images as fiction and entertainment,’ she said. Criticism has also been leveled by Canadians on Twitter, who argue that the footage may trigger feelings of PTSD and additional victimization. But despite the outcry, Netflix isn’t backing down. A Netflix spokesman said the company doesn’t plan to cut the footage from Bird Box. ‘We will keep the clip in the movie,’ the spokesman said, adding that Netflix will be looking at ways to do things differently moving forward. And this isn’t the first movie or show that Netflix used the footage in. The train crash also appeared in the popular sci-fi drama series, Travelers. The show was created by Brad Wright, of Canada, and has been renewed for a third season. 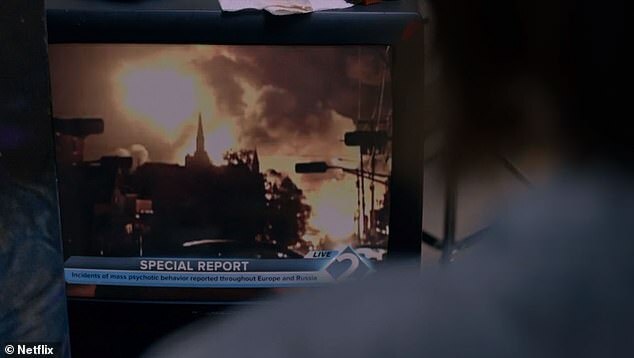 In Travelers, the footage is seen in one episode that’s meant to portray a nuclear attack in London, but it actually shows the train explosion. High school teacher, Guillaume Bouchard, noticed the footage in the Travelers over the holidays. Bouchard said he was shocked that the scene was used in the show. According to Canadian newspaper, the train crash footage for the Travelers was acquired from Toronto-based company, Peacock Alley Entertainment. The company’s president, Carrie Mudd, said her company received the footage from Pond 5 as well. ‘We sincerely apologize and had no intention to dishonor the tragic events of 2013,’ Mudd told the Globe and Mail. She said her company is working to ‘replace’ the footage in Travelers. It’s also not the first time Bird Box has caused an outcry. YouTube has said it will be cracking down on a wave of users committing so-called ‘Bird Box Challenges’ – like driving a car while blindfolded. 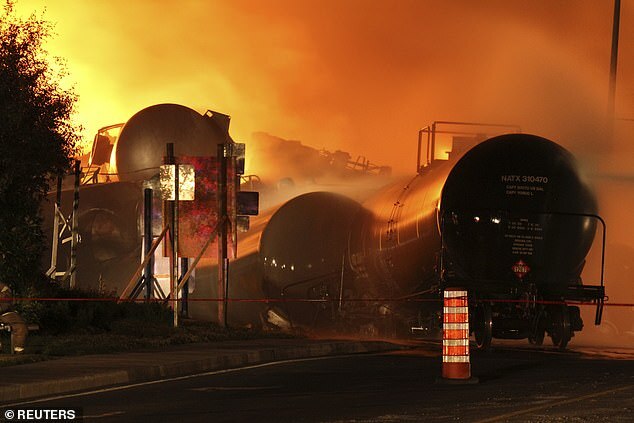 In 2013, the train, which was carrying 72 carloads of volatile oil from North Dakota, had been parked on a railway line for the night when it derailed, hurtled down an incline and slammed into downtown Lac-Megantic. 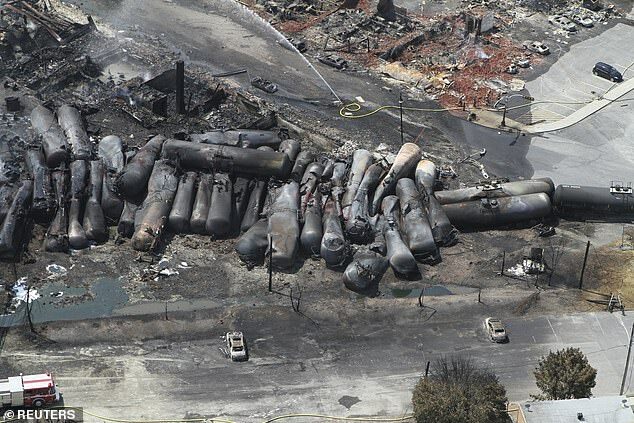 Several train cars exploded and 40 buildings were leveled. Parts of the town were evacuated in the early hours of the morning as fireballs shot high into the sky, flames spread to nearby homes and thick acrid smoke filled the air. 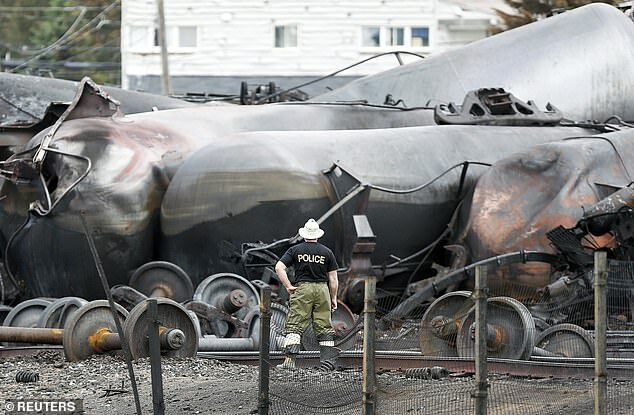 The weak safety culture at Montreal, Maine & Atlantic Railways and poor government oversight were among the many factors that led to the oil train explosion, Canada’s Transportation Safety Board said in a report during their investigation. Several lawsuits were filed following the incident and the now-bankrupt railway as well as several of its former employees, settled with federal prosecutors in February 2018. 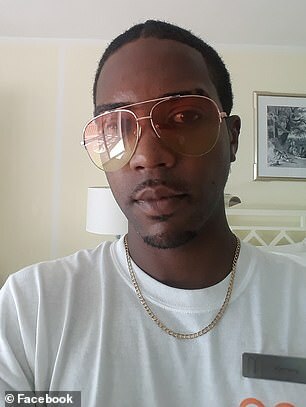 They were ordered to pay fines totaling $1.25million. Montreal Maine and Atlantic Railway was found guilty in Quebec Court of violating the Fisheries Act after crude oil leaked into the Mégantic Lake and Chaudiere River. The company was forced to pay $1million due to ‘the seriousness of the infraction,’ Josee Pratte, lawyer with the Public Prosecution Service of Canada told the National Post at the time. Six former employees also pleaded guilty to violating the Railway Safety Act when they failed to ensure the train was properly secured. Michael Horan, Jean Demaitre, Kenneth I. Strout, Lynne Labonte et Robert C. Grindrod were ordered to pay $50,000 each. Former train engineer Thomas Harding, who was responsible for parking the train the night before it derailed, was given a conditional sentence of six months in prison. Railway controller Richard Labrie was acquitted. Hurricane Florence: Why do storms and hurricanes have names?